The WEC Group with it’s head quarters based in Darwen Lancashire have continued in their expansion with the installation of a fully automatic on line conveyor pretreatment and powder coating plant. Situated in it’s own shop at the site in Darwen, WEC can offer a full sub contract powder coating facility to the Lancashire sheet metal and fabrication market. 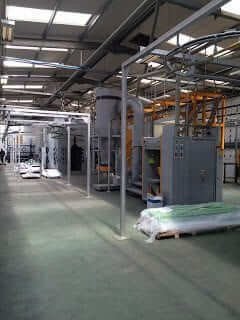 Read more on powder coating ovens or alternatively, you can read our blog on Coating line.